Fusion 360 brings CAD and CAM together in the cloud. It's an integrated, connected, and accessible platform built for the new ways products are being designed and made. Fusion includes native CAM support for all Standard, Benchtop, and PRO CNC Router Parts machine kits. 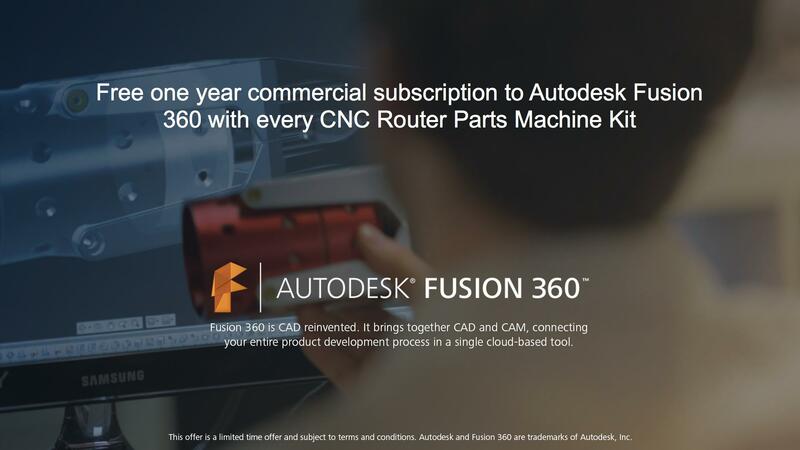 For a limited time, CNC Router Parts is excited to offer free, one-year, commercial subscription to Autodesk® Fusion 360™ with every qualifying[*] CNC Router Parts machine kit purchase! Sounds Interesting! How Do I know if Fusion 360 is for me? Start designing your next CNC Router project now, Download and register for trial or enthusiast use now and upgrade to commercial for free when you purchase your CNC Router Parts Machine Kit! Review the Fusion 360 System Requirements to ensure you will have a optimal experience with your Mac or PC.